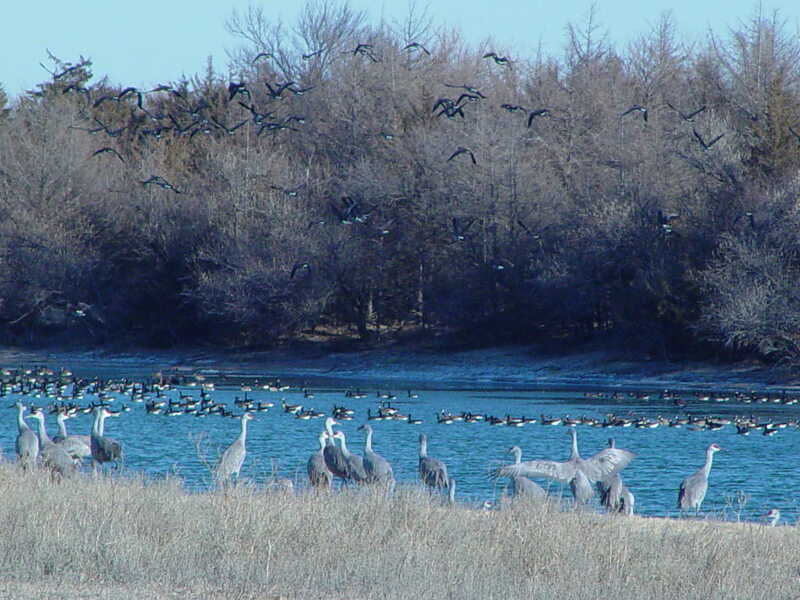 In the middle of February, the Sandhill Cranes will begin arriving in the thousands. By mid-April, 600,000 cranes will have rested and fed on Nebraska corn in preparation for the long journey north. If you are interested in witnessing one of nature's most magnificent migrations, make your travel plans now. Burchell's White Hill Farmhouse Inn is near Audubon'sRowe Sanctuary, a premiere crane viewing site on the Platte River. The cranes come every spring...isn't it time for you to come and watch? For over nine million years, cranes have used the Platte River Valley in Central Nebraska for relaxation as they travel from southern wintering grounds in Texas and Mexico to northern breeding grounds in Canada, Alaska and Siberia. Whooping cranes, eagles, ducks and geese, and shorebirds also migrate through the Central Flyway. It is an amazing sight. Crane season reservations at the Farmhouse Inn can be made after November 1. A two night minimum stay is required. There is a two week cancellation policy during crane season. Contact Bob or Linda at 308-832-1323 for more information.